Up to 33 g/t Au in newly discovered gold-copper porphyry system at Hazelton | Jaxon Mining Inc.
Jaxon Mining Inc. (TSXV: JAX, FSE: OU31, OTC: JXMNF) is pleased to announce high grade gold and tellurium assays from a second phase of expanded sampling at its Cirque-Ridge-Tarn (CRT) target within its extensive Hazelton Project in Central British Columbia. The CRT target is located approximately 17km SW from Jaxon's MAX silver-zinc target. Highly gold-enriched breccia complexes returned assay values up to 33 g/t Au. Single breccia outcrops occur over widths up to 5 metres and intermittent strike length up to 3 kilometres. Discovery area of multiple high-grade gold breccia zone complexes expanded to at least 1.5 kilometres by 3 kilometres. Further evidence that the CRT and RS (Red Spring) targets are genetically related to a large intrusive/porphyry system. Jason Cubitt, Jaxon's president and CEO commented: "This is showing all the signs of a large precious and base metals-rich porphyry system and may be a primary engine driving mineralization in the entire district. I congratulate our technical teams for the excellent work they've done identifying it." Mr. Cubitt continued: "Based on this discovery, Jaxon now has two primary discoveries within the Hazelton district, the now-confirmed Max VMS system and the CRT/RS system hosting high grade precious and base metal mineralization." The initial discovery of extensive breccia bodies which returned high grade gold and tellurium assays from the Cirque-Ridge-Tarn (CRT) was reported in Jaxon's press release of September 14, 2017. During the fall exploration season Jaxon expanded the surface prospecting coverage of the brown and bright red gossanous areas of the CRT and RS prospects with a further 49 rock samples collected from the CRT. This work not only returned high grade gold assays but also expanded the extent of the tourmaline breccia occurrences to three separate cirques approximately 500m apart. Sample grades from these three cirques now include 33.8 g/t, 18.4 g/t and 18.3 g/t gold with tellurium concentrations exceeding 73 g/t. Table 1 summarizes the most significant rock sample results to date. The tourmaline breccia bodies are manifest as both near vertical planar structures and as apparent stratabound bodies. The high sulphide content results strong oxidation, making the mineralization very visible as brown, rusty outcrops. The tourmaline breccias are characterized by the chemical association of gold-tellurium-bismuth-arsenic-antimony-boron which Jaxon interprets as being indicative of an intrusive origin for the mineralization. Both the CRT and RS areas display strong evidence for explosive mineralized breccia body and vein complex formation in what is interpreted to be at high levels within an intrusive system. The main granodiorite intrusion (Blunt Mtn. Stock) and its thermal metamorphic aureole in the Bowser Group sediments does not appear not to be the origin of the best gossanous areas at CRT and RS. Small argillized granitic bodies and sulphide breccia exposures at the RS as well as the tourmaline-quartz -sulphide breccia bodies and veins at the RS and CRT are found to be well mineralized. Primary coarse iron pyrite and arsenopyrite are often preserved in veins and breccia at surface. Blind and buried hydrothermal-magmatic intrusive sources providing clasts for the tourmaline matrix breccia are a more likely source breccias seen at surface at the RS and CRT prospects. Veins and tourmaline-quartz bearing breccias of many descriptions have been found indicative of a long- lived system. Jaxon has not yet mapped pipe-like tourmaline rich breccia bodies. However, limited exposures and samples of talus debris material display sulphides in open spaces, sulphides in quartz-tourmaline matrix cement, sulphides in sheeted veinlets -veins in sericite altered host rock adjacent to tourmaline-rich zones or veinlets. Most carry elevated gold with tellurium when sulphides are present. There is a considerable variation in the breccia textures showing chaotic and milled or jumbled appearance, angular to subrounded fragments, so-called " shock and shingle" textures of bounding host rocks. The textures are visually impressive, sometimes, with open spaces in jigsaw puzzle textures of acicular crystals, needles, or radial fibrous splays of black tourmaline. The textures are indicative of highly fluidised, high pressure hydrothermal processes typically associated with the intrusive-porphyry environment. Red Spring has several features not yet identified in the high level CRT hydrothermal setting possibly due to the differences in erosion and uplift levels of exposure of these systems. The RS has some small quartz bearing argillized granitic bodies, chaotic sulphide explosive breccias and magnetite alteration overprinting some of the Bowser sedimentary units as well as significant tourmaline veinlet-vein and breccia development. Although most of the primary disseminated pyrite is now gone at RS, it appears that a greater amount of sericite alteration is still present as compared to that seen at the CRT targets. 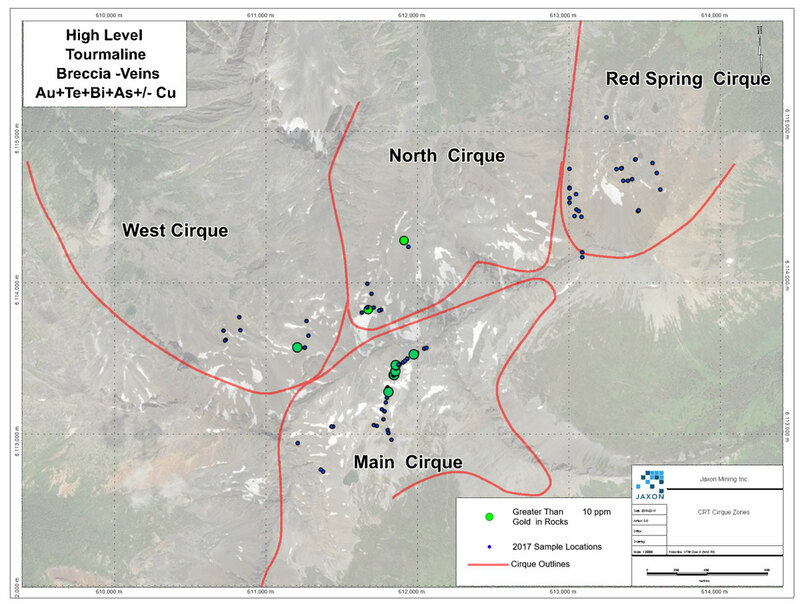 Many of the surface exploration, first pass, prospecting rock samples collected in the RS area have residual anomalous copper contents. Three hydrogeochemical water samples were taken from the RS drainage and spring itself. High levels of K, Na, Ca, Mg, and Mn were present with up to 32,000 ppb Sulphur. Two samples contained copper measurements of 0.95ppb and 4.6 ppb Cu along with anomalous zinc levels up to 6.8 ppb. These data indicate that copper and intense alteration is in contact with the leaching water regime and that the presence of primary copper sulphide mineralization atsurface may not have survived. In British Columbia, this surface copper leaching in the alpine environment is also found at the active exploration and mine sites such as Red Chris, Galore Creek, Treaty Glacier and at Mitchell-Sulphurets-Kerr zone and Iron Cap. All of these important copper porphyry systems have had blind discovery of major portions of their mineralized system at depth. Jaxon intends to undertake a major program of geological and alteration mapping over the CRT and RS prospects over the 2018 field season based on this exploration model. The program will include further geochemical sampling, geophysics and first pass drilling on the CRT breccias. The objective for the RS prospect is to define the character and extent of the large alteration system of the large alteration with the objective of defining drill targets for the 2019 season. Prospecting samples were collected in the field by experienced, professional prospectors and geological staff who selected hand samples from outcrop, chip samples, boulder and talus debris samples suitable for slabbing by rock saw. The samples were numbered, described and located in the field for follow-up. Numbered rock sample tags were placed inside each bag which was securely closed for transport to Jaxon's' secure cold storage locked facility in Smithers, B.C. At the end of the diamond saw core cutting program for the Max drilling project in December, representative sample slabs were cut from large specimens and halved rock samples so that portions of most samples collected in the fall could be saved for the Jaxon's rock library, descriptive purposes and petrographic study. MS Analytical of Langley B.C. received the Rice Bag shipments after secure transport from Smithers and they prepared the samples by crushing, grinding and pulverizing to a pulp with barren material washing between each sample at the crush and pulverizing stages. Then 20 g of pulp was used for the (IMS-117 code) ultra trace level ICP/MS AR digestion method, and four acid 0.2 g ore grade ICP -AES method (ICP-240) and for the overlimit gold the FAS-415 method of 30 g fusion Gravimetric method was used to report gold ASSAY 33.8 ppm. Laboratory standards and QA -QC is monitored by Jaxon. Technical information in this news release has been reviewed and approved by Derrick Strickland, P.Geo., a qualified person as defined in National Instrument 43 - 101. Jaxon is a precious and base metals exploration company with a regional focus on Western Canada. The company is currently focused on advancing its Hazelton Project in north-central British Columbia and the More Creek Project (consolidating the Wishbone and Foremore properties) in BC's Golden Triangle.